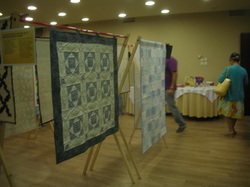 During the month of October we will be taking the original exhibition from the Thessaloniki Quilting Conference (September 2012) on the road to various areas in Greece. Some areas will offer workshops and others only demonstrations of interesting quilting techniques.At each location we will be offering a sign-up sheet for you to sign up for quilting lessons in your area. Below you can find our schedule. Hope to see you along our tour! !